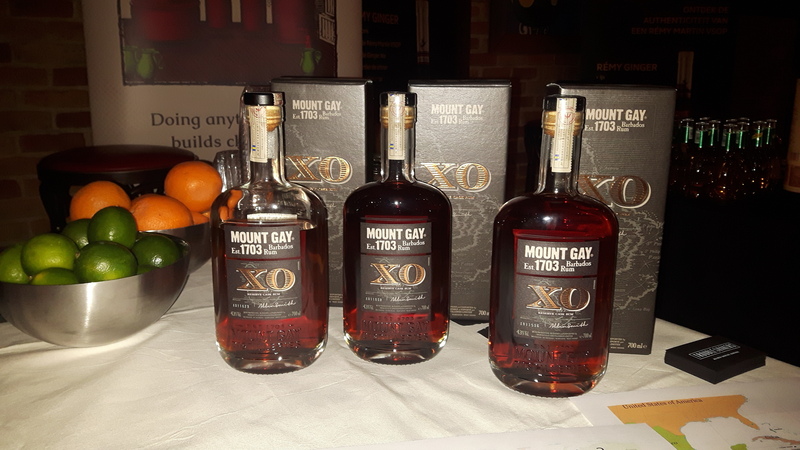 Have you found an online vendor selling Mount Gay XO Extra Old? Mount Gay Extra Old (often written "OX") is a blend of rums aged between 8 and 15 years in American bourbon barrels. Mount Gay Distilleries is the oldest operating distillery in the Americas - producing rum in Barbados since 1703. It's original name was Mount Gilboa, and in 1801 renamed Mount Gay after the distillery's manager Sir John Gay Alleyne. Fruity on the nose with overripe banana and spice. A light fruity flavor with hints of dunder and a little warmth. A long finish with a spicy reminder left behind. Stop! You're killing me...HA HAH ah (hack!) HAH! That was for those rating this under a 7. This is a real rum. I suspect a tiny morsel of added sugars due to the "smoothness" - a dead give away for tossing sugar cubes into the batch for any rum less than 15 years old - but this an authentic rum, non-Western diabetic marketing concoction bordering on cough syrup. Tasting notes are not needed. It's a better rum than Abuelo Centuria. MGXO has an almost perfect balance between of dry & sweet, wood and salivation, aged too long and not long enough. If you don't like this, head for the Zaya aisle. If you do, come on over and have a glass you discriminating, sophisticated, demanding drinker, you. Wow, this is just a perfect rum. It's impossibly smooth, naturally sweet, full of molasses and toffee, some oak, and a whole lot of perfection. Compare this miraculous rum with Plantation XO (also from Barbados), which has more added sugar than children's juice boxes. You can spend much more for rums which are as good as - but not better - than this one. Straight up, right? Mount Gay is a quality product to the world of rum. Mount Gay serves a great bridge point to all drinkers. It is not sweet enough to scare away those who prefer earthy/dry spirits (scotch drinkers). It also is not dry/earthy enough to scare away a sweeter preferring drinker. It is the best balance of sweet and dry rum I might ever have. It's characters of the bourbon barrel are very distinguished and give this rum 90% of its characters. The issue with mount gay is the ingredients do not stand out as much as they should. The rum straight is pretty simple in this regard with a little harshness in the back. This is best served with a light amount of cola or ice to get rid of the slight harshness. Mount gay is a great addition to the collection if it is a decision between this or zacapa 23 (2 commonly available top shelves) take this. A perfect analogy of this rum is the good but not best looking girl in the class who happens to be relatively smart and sweet. Is she the knockout with the bold fiesty personality. No, she just prefers to let her quality characteristics sell herself. If mount gay ever got brave and added more boldness to the rum (larger amounts of ingredients per batch ) we could be looking at a perfect rum. i smell some dark fruits. pepper, ginger, barbados! i taste fruit and tons of spice. pepper. ginger. some hints of vanilla and chocolate. 10/10 - drop 5 from this score if you love sweet rum. full bodied powerhouse for a very really fair price. if one god exists and would ask me: take three rums with you to heaven, i think, one of them would be this! A very heavy and balanced mild rum. One of my favorites! This was a great rum. Not as sweet as previous rums such as El Dorado, but great. Reminiscent of a good scotch. Scotch drinkers will love this one. Phenomenal complex aroma that gets better as it sits in the glass longer. Drink straight up! Mount Gay XO is truly a special rum. Not sweet like some other aged rums. Gives you that "real" rum flavor but smooth and delicious. This must've been the type of rum that the was the "special bottle" the pirate captain would keep hidden in his cabin. Outstanding. My brother poured me a sample of this the other day. I have spent much more time appreciating scotch than I have rum (this may start to change ;-) It did have a sort of earthiness and smokiness reminiscent of a scotch. I enjoyed that very much! I recommend this rum to all my whiskey/bourbon drinking friends. It's got enough oak and lingering burn to keep them happy, and I enjoy the surprised look on their faces as they realize how satisfying a good rum can be. Sweeter than a wheated bourbon, but not at the sacrifice of complexity. At $40 in my local ABC, it's a no-brainer. I often have my wife pour me something at random from the "cabinet" when I get home after work. Since I have few bottles of rum, but plenty of bourbon, I was initially misled into thinking that was what she had poured, due to the deep, rich color in the glass. What really struck me as I was trying to discern which "bourbon" my wife had poured for me, was how much brown sugar was coming through, in addition to the more staid, but still enjoyable, flavours of leather and old, wood-paneled office/study. But that brown sugar wasn't the cloying sweetness of something added; it came straight through from the distillate and barrel wood. My discovery that it was Mount Gay XO has only added to my enjoyment of this bottle. Blind tastings often help me to discover things in a drink that my expectations might be hiding. Mount Gay has a ton going for it, and lot's more to be discovered. There is nothing better than this for the price. You can head upstream but there's diminishing returns for the amount of money you have to spend. I have a bottle of this always. This rum does what many more expensive rums can't, that is remain smooth without added sugar. Compared to the Plantation 20th or the Diplomatico or El Dorado it's not as sweet but it's also unadulterated and more complex. This should be your benchmark. Ok I'm no expert but for me nose gives light sweet spiced molasses, light citrus and a hint of vanilla. It arrives medium sweet and spicy developing hot black pepper sweet citrus fruits, apple with some vanilla and a touch of tobacco. Finish is fairly long and gives more sweetness and fruit with some light leather notes as it closes. Aftertaste gives lingering tobacco and vanilla and is not drying. It's fairly priced and goes down well plus only a touch of added sugar and colour so kind of a craft presentation in the rum world. Anyway I'm enjoying it!! The aroma from the bottle made it seem this was going to be a sweet rum but it is drier than I expected. There is a bit of a molasses flavor initially but then the burn hits masking any sweetness. Those who prefer a drier rum will probably enjoy sipping this neat but it's definitely an excellent mixer for me. Nothing too special in my opinion. A rum for your standard evening sip - not the special occasions. Mount Gay XO screams excellence. Great balance of spice flavors, sweetness, oak. This rum has it all. Almost impossible to pin a style to it, other than it should be what you conjure in your head when you say rum. I think it is hard to go past this for the money. Just about everything one needs in a mid priced rum, fresh, spicy, rich and peppery very well balanced oak for the money. I have had rums for twice the price that were half the drink. MG XO is smooth enough to sip yet robust enough to mix without getting lost in the mix. Although very obviously rum it's reminiscent of a Highland region single malt in terms of smoothness, dried fruit and alcoholic kick, may be its the common use of ex bourbon barrels in Highland malts as with MG XO for maturation. Neat, or on ice, always enjoyable. Respect it, but mostly appreciate this rum for the complexity it provides. It's a nice rum, gets better as you let it breath, not too sweet. Very smooth for very little to no added sugar.